In a 1 1/2 quart casserole dish, layer the chicken, ham, leeks and onion a couple of times each until the dish is full. Season each layer with a little salt, pepper and mace. Pour the chicken stock over the layers, and dampen the edges of the dish. Roll the pie pastry out large enough to cover the top of the dish, and place over the top. Crimp the sides down with a fork, and trim the excess from the edges. Cut a round hole in the center of the pastry. Roll dough scraps out and cut into strips. Use the strips to form a design, and place lightly over the hole. Brush the entire top with milk. Bake for 35 to 45 minutes in the preheated oven, until chicken is cooked through. If the top crust is getting too brown, cover it with parchment or aluminum foil. While the pie is baking, heat the cream over low heat. 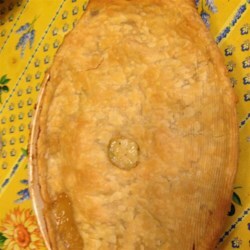 When the pie is cooked, remove from the oven, and carefully remove the design from the hole. Pour the cream into the hole, and replace the design. Let stand for a few minutes before serving.